The Hotrock24 is a mountain bike event that runs over 24 hours. Camping is available on site. 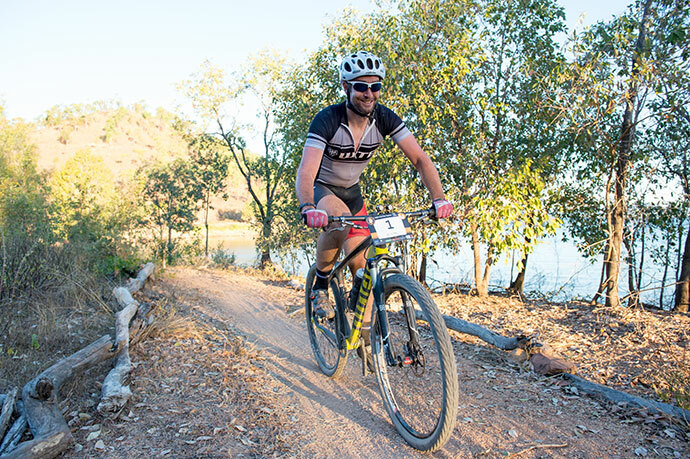 It’s at the Ross Dam Townsville over a variety of fire trails and single track. Ride as a solo or in a team. Rockwheelers Mountain Bike Club promotes events suitable for families. Food and entertainment are on-site throughout the event. There’s heaps of entertainment to keep you happy between laps, or while relaxing in the event village, including activities for the kids. Including a jumping castle, face painting, movies under the stars (any favourites? ), a trials riding demonstration, and whatever else we can come up with between now and then. We will get our groove on to some awesome tunes from local band Spun Monkey. How good were they last year?? Will be in abundance. There will be a coffee van with heaps of goodies, as well as food provided by Woodlands Scout Group. The menu includes: Sat and Sun mornings bacon and egg burgers, pancakes. Lunches and dinner – burgers, open plate snag or burger pattie with salad. All day – snag on bread, burgers to order, hotdogs, popcorn and cold drinks. All money raised by the food sales goes straight back to the group – what a great cause! Find out more and register here: http://hotrock.rockwheelers.com.au/index.php/race-information/categories-and-fees.